Using the half square combination units we just made, the Color 2 strips and squares, and the remaining four single Half Squares, construct the seven rows shown at left. 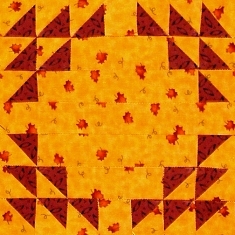 Sew the rows together to complete your block! Here are four blocks by five with a simple piano key border!